One of the big draws of private community life is the added security it offers families. Your neighborhood is probably well protected against intruders and other potential crime. But is it also protected from dangers within your own community? Speeding drivers can cause lifelong damage in just an instant. What are you doing to prevent speeding on your streets? 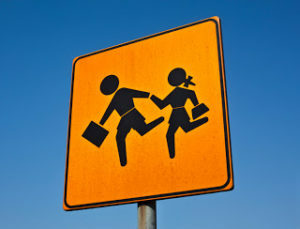 Are you taking action for pedestrian and bike safety? As spring starts in earnest, now is the perfect time to make sure that your streets are safe for kids to ride and walk on. In fact, people around the world devote this time to the cause. May is dedicated as Global Youth Traffic Safety Month and is also National Bicycle Safety Month. Now is the perfect time to teach bikers to take safety precautions. It’s also just the time to make sure your streets are safe for them. Separate bike lanes and lower speeds can help make that happen. For many, bike safety is equated simply with wearing a helmet. But with 840 bicyclist deaths on U.S. roads in 2016, more needs to be done. Chances are if a car and bike collide, the biker is more likely to be injured. Crashes need to be prevented before they happen to protect cyclists. 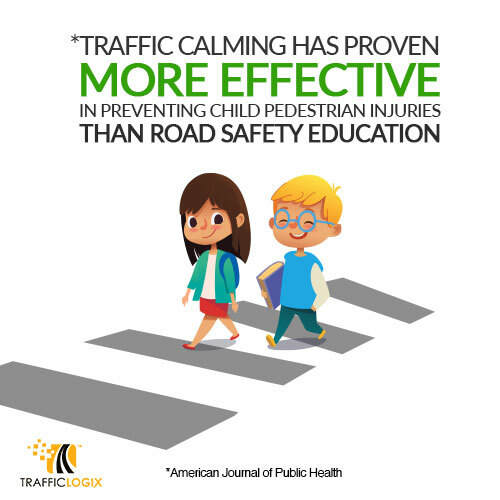 And while education is an important part of any safety campaign, studies have shown that traffic calming is more effective in preventing crashes than education is. There are many ways you can make your community roads safer. But targeting youth bike safety is a great way to start. 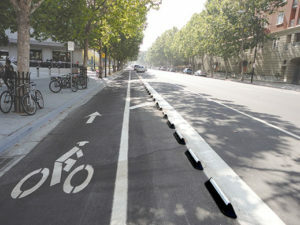 Recycled rubber bike lane dividers can help you create dedicated space for children to bike. The unique sloped design of our bike lane curbs gently guides bikers back into the bike lane. The higher edge on the traffic side makes sure that vehicle traffic stays away. Radar speed signs are a versatile tool that help to lower speeds on local roads. They are available in a range of sizes and prices for traffic calming that works for everyone.